Living at Baker Block has been better than I expected so far. I love the apartment itself and the amenities in the building are great. The staff has been nothing but wonderful as well. So far i haven't had any complaints. Everyone in the neighborhood seems to pretty chill and polite. The staff is also super nice and also very greeting. One of the best apartment complex we have lived in! The amenities are top notch and staff is the friendliest. Great smaller boutique apartment complex and close to shopping and restaurants. Having a great time so far and really enjoy the apartment community. Everyone is very friendly and respectful. Excited to be living in such a great apartment community! So far so good. Everyone here is super friendly and super nice. Never had any issues. One pain is the speed bumps in the garage since it takes forever to go over in a low car. The community is good and the environment is very nice. The facilities are various that can satisfy everyone’s requirement. There are free cofffe in the lobby and the office workers are friendly and welcomed. But sometimes the parking is very busy. What a clean place to live with wonderful staff! I am happy to come home to such a luxurious place. I love hosting and impressing my friends with the amenities provided. I am very happy living at Baker Block. The staff is ver friendly and super helpful when needed. The only reason I didn't give it five stars is because I am not content with the gym; it's pretty small and doesn't really have too much equipment. I also don't like how far the parking garage is, but thankfully I live On Pullman so I typically park on the street. My last issue is with the location of my room. It's next to the gate on Pullman and anytime someone comes in or out, I can hear it closing; it's pretty obnoxious. Other than that, great place to live! Very loud. Very very loud. Planes, fire alarms, car alarms on both sides of me, people revving their engines, and an upstairs neighbor that literally runs the length of their apartment all day. Also very very cold. On its surface it’s beautiful and there’s a lot of incredible perks but the staff is lacking in attentiveness and friendliness and the actual apartments have a lot of flaws which make us feel like it was cheaply made. I've lived at Baker Block for about a week and I'm extremely Impressed. My GF loves the place. Everyone that works in the leasing office have been Amazing and very helpful. Great customer service and assistance upon signing a lease. Always willing and able to help. The leasing office was also very helpful and accommodating on our move in date with allowing us to use certain areas to unload our belongings. I love where I live so much. I find myself saying that a lot! It’s clean, nice, relatively quiet and helpful. I love being in Costa Mesa - the location is great. It’s been a great experience so far! It was love at first sight! LOVE the 24/7 gym access with Pilates/yoga/dance classes available, storage units for rent on every floor, pool/hangout area with cabanas and artificial grass, free garden area, apartments/lofts, sky lounge, and the whole baker block beachy-art vibe, and the whole community area. However, I do not like seeing everyone's trash in the hallway outside their doors (no trash shoots), our apartment faces "Ziething Company" they slam gates really loud and it disrupts our sleep, people above us thumping on the floor every time we are home (day or night) we have contacted management about this is still a recurring issue. 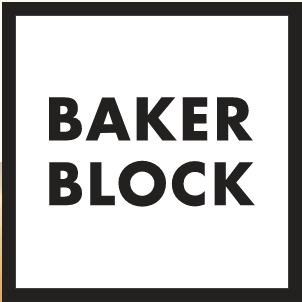 Baker Block is amazing! I love the feel from the moment I drive up. Everyone is friendly and the space is immaculate. The office staff is kind and helpful. The events are so neat and different from the norm. The valet trash makes me never want to leave 😂. Thank you for providing a great experience! I really love the front office staff. Nothing is ever perfect, but I do appreciate their professionalism and their dedication to making it a great place to live! I love how the community is growing as I meet new people at our community events. I love how dog friendly it is -- my pup gets tons of dog interaction every day! It really is a great place to live and I thank all the dedicated staff that work hard to give us this experience. Community 5 Stars. Management no stars. Apartment still dirty. After multiple requests to have it cleaned before move in. Management will disappear from time to time. Very frustrating. Me & my boyfriend love the rooftop, we love that we can go grab a coffee in the lobby and just sit any spots by the fire place and talk. The staff are sweet and amazing as well. Definitely feels like home. It’s a nice place, great amenities and the staff is very professional. However, the noise can be car sometimes, as well as the parking. They need to figure out the package delivery situation. I love where we live! Great location! Love the amenities! Great leasing staff they are always very friendly! We love the rooftop at Baker block as well as the fit pits around the complex! Always want to be home to enjoy what we have! Thank you Baker Block! Only been moved in for about 2 weeks good so far. Not five stars because even though our unit is brand new there are a couple things that were put on crooked and while we were trying to move in there was dog pooped smeared across the walkway.